The first trailer for Thor: Ragnarok — Taika Waititi’s next indie film — has been taking the internet by storm this morning, with its neon-soaked color scheme, lighthearted humor, and incredible helmets. Alongside fellow 2017 Marvel movies Guardians of the Galaxy, Vol. 2 and Spider-Man: Homecoming, Ragnarok seems to have a certain life to it that other films in the super hero genre — including Marvel’s own recent efforts — have been lacking. And a lot of that, I think, has to do with Ragnarok’s setting, which seems to be ditching the tired scenery of Earth for something a little more... extravagant. Putting aside the original Guardians of the Galaxy for a moment, almost every Marvel movie has been centered around good old planet Earth. Which makes sense, given that these movies, especially at the beginning of the Marvel Cinematic Universe, needed to attract an audience far larger that comic book fans. And so they found ways to ground the fantastical ideas of the original comics, whether that was as vaguely realistic as man flying in a super-powered iron suit or a fish-out-of-water Norse god of thunder. Placing the action in familiar environs like New York City or Albuquerque made superhuman stories feel human, and intergalactic stakes feel immediate and relatable. But we’re nearly ten years into Marvel’s superhero franchise at this point, and what once was fresh is growing old and tired. Thor: Ragnarok seems to be taking the same approach as Guardians of the Galaxy (itself a breath of fresh air for superhero cinema) by moving the action to a more fantastical setting. Or to put it another way, we’ve seen everything these heroes can save (and destroy) on Earth. Now, it’s time for a road trip. We’ve known for a while that Ragnorak would be more of a “road trip movie” showing off a buddy dynamic between Chris Hemsworth’s Thor and Mark Ruffalo’s Hulk. And if the trailer (or at the very least, Hemsworth’s trillion watt smile in this GIF) is anything to go by, taking these characters we’ve gotten to know over the last few films and shaking up the setting looks like it’s going to lead to some results that, at the very least, will be distinguishable from the superhero movie churn. You only need to look at recent entries like Ant-Man or Doctor Strange to see that some change was needed. Both films were perfectly fine entries in Marvel’s lineup, but suffered from the same simple problem that we’d seen those same stories before. Doctor Strange’s origin played like Iron Man with more cultural appropriation and, somehow, a thinner love story. The best parts of those films were scenes like Michael Peña’s scene stealing exposition monologue or the mind-bending visuals from Strange’s trips amongst the multiverse — things that were wholly new to Marvel’s sprawling franchise. And the new “road trip” direction is especially significant for Marvel given the state of its competition. After all, DC looks to be making up ground this year by borrowing from Marvel’s playbook through with a one-two punch of the character driven Wonder Woman and a more lighthearted Justice League. And Universal’s Fast and Furious franchise is resembling a superhero franchise with each passing submarine missile. It’s obviously too early to call Ragnarok a success at this admittedly early stage. We already know from the Doctor Strange credits teaser that the action will be making its way back to the more familiar streets of New York at some point in the film, and it’s possible the change of pace is only temporary at best. But for now, it’s nice to see that in a series full of extraordinary heroes with abilities from some of comics wildest imaginations, we’re finally getting settings to match. Because while its films may have spent the last almost decade stuck firmly on the ground, it’s time for Marvel’s heroes to start shooting for the stars. Thor: Ragnarok’s teaser trailer, while clearly focusing on the first part of the movie, had a lot of great and important bits in it. A lot of them are related to the various comics connections this movie is pulling together to make one, big, delightful spectacle. In case you were wondering how bad things are for Thor (Chris Hemsworth) at the start of this movie, the answer is: real bad. Also, we can track a lot of things based solely on Thor’s hair. It’s long and luxurious here, so it’s part of Thor’s initial meeting and loss to Hela (Cate Blanchett). “Now, I know what you’re thinking. ‘How did this happen?’ Well, it’s a long story.” I fully expected this teaser to end with the reveal that Thor was telling this story in a bar to the Hulk (Mark Ruffalo), or to an unimpressed Valkyrie (Tessa Thompson). Regardless, as dark as all this looks, this whole trailer indicates this is going to be a romp, and Thor’s introduction sells it. If you are unaware, Hela is the Norse goddess of death, reigning over Niflheim and Hel. In the comics, her conflict tends to be that she wants to expand her power to include the dead of Valhalla, which Thor and Odin aren’t fans of. Also, she’s the daughter of Loki (Tom Hiddleston). But, like, not exactly the Loki we have. It’s comics and mythology, okay? It gets complicated. There’s been no word on whether or not that particular aspect is going to be part of the movie, but it’s hard not draw links when her green, gold, and black costume echoes Loki’s so strongly. Again, this is clearly from early in the movie. Blanchett has said that Hela has spent millennia trapped and stewing in her anger before being let out to wreak havoc. If you want to show how powerful your villain is, have her destroy Mjolnir. Update: As pointed out by RonDunE in the comments, there is someone standing next to Thor right before the blast. It looks a lot like Loki, but if this is in New York, it could be Doctor Strange. Hela has two looks in this movie: The one where you can see Blanchett’s face, and the one with this hornèd (it deserves the poetic accent) helmet. And, boy, did they actually manage to make a comic book look work. While there is a lot of the original, old-school Marvel in her helmeted look, the “recently released” chic is borrowing from more recent books. “Asgard is dead,” proclaims Hela., which would fulfill a bit of the “Ragnarok”—the death of the Asgardian gods—part of this movie. In the early 2000s comics, the death of Thor followed the embodiment of Ragnarok going around killing off all the Asgardians. It kind of seems like Hela is taking on a bit of that role herself. In earlier comics, she has also schemed to bring about Ragnarok with Loki, by killing Balder and attacking Asgard. Odin stopped them. That attempt seems closer to what we’ve seen in this footage than the later, more famous Ragnarok. Although, with Loki in charge and Odin missing, you have to wonder what the plan is. And if Loki fully has a handle on it. Anyway, destruction on Asgard, and Thor falling. I feel like this is what leads to him being in chains, as we saw in the opening of the teaser. Or this fireball sends him through a portal that lands him on Sakaar. It should be noted that Hela crushing Mjolnir looks like it happens either on Earth or on Sakaar. We do know that Thor doesn’t fight on Sakaar with Mjolnir, so either 1) the confrontation with Hela happens on Sakaar and she crushes it and leaves Thor to get killed in the gladiatorial fights. Or 2)after the big explosion, Thor briefly ends up in Hel, manages to get to either Earth or Sakaar, where Hela ruins Mjolnir. Then she presumably dumps him on Sakaar anyway. Either way, things are not going great for Thor. And while Hela’s look is hewing really closely to the comics, Valkyrie’s look here is very different. Her outfit in the comics is often black and silver, but is also more Asgardian-looking. However, since this Valkyrie has been hanging out on Sakaar for who knows how long, this makes a certain amount of sense. By the way, why is Valkyrie hanging out on Sakaar? In what looks like a flashback, Valkyrie (with Valkyries, plural) fight Hela. And you can see in the first comic panel I included of her, she has a blue cape. The falling figure in this shot has one, too, so I think we can safely say that Hela and Valkyrie have history. History that’ll play into Valkyrie helping Thor get off Sakaar and return to save Asgard. But before that, Thor many indignities are delivered unto Thor. Here’s a better look at Valkyrie. I know she’s not holding energy drinks, but man does it look like she is. Heimdall (Idris Elba) survived the first strike, but Hela’s forces (judging by the color scheme and the spikes) are hunting him down. I’ll bet good money that this is from Thor and company getting off Sakaar in the Grandmaster’s ship. I really do appreciate that everything we’ve seen of Sakaar looks and feels like it inhabits the same place as Guardians of the Galaxy. Not that anything’s identical, but that the technology style and the same colors (oh thank god, colors) permeate both. Say hello to Skurge (Karl Urban). Comics Skurge is also called “The Executioner” and is a villain of Thor’s. He’s also a villain that fell in love with Enchantress and spent a fair amount of time doing her and Loki’s bidding. Of course, Skurge in the comics also helped (in what Chris Sims called the best redemption plot) various heroes escape Hela’s forces during a mission to Hel by holding a bridge long enough for them to cross. The former antagonist-turned-compatriot is a good beat for this movie to include. Taking that story and turning it into Skurge holding back the Grandmaster’s/Hela’s forces as Thor escapes Sakaar wouldn’t be the worst thing in the world. In other news, yeah, Skurge’s look is also very much right out of the comics. That this shot takes place right after the one earlier in the teaser, but that Hela now has her helmet. Apparently she can call it up like Loki does with his helmet, and we’ve heard Hela’s helm is a powerful weapon of its own. It also looks like it’s moving, which lends credence to the rumor. I have no idea what side Loki is on. None. He could be defending these people or just generally ready to fight. The comics would suggest he’s working with Hela. The part in Doctor Strange where Thor said he’s looking for his brother indicates Loki’s on the run just like Thor and Heimdall. So... your guess is as good as mine. I think he’s working with Hela, though, given that he pops up as a guest to watch Thor fight on Sakaar later. Now we’re back to Sakaar, with Jeff Goldblum announcing that it’s “main event time.” And movie Thor has a haircut right in line with his current comics counterpart. This movie’s headwear game is on point. And, this one’s for everyone bitching about Thor not having his classic headwear for pretty much every other scene in every other movie. In case you somehow missed it, yeah, this movie’s comics smoothie includes Planet Hulk. Drink up. I like the announcement getting “your incredible....” I just wish Goldblum got out “Hulk.” Please just let us have this one. And Hulk is definitely wearing the armor we saw on display at SDCC last year. Two things: 1) There is something very American Gladiator about Thor’s look. 2) No one has ever in the history of time been happier than Thor is, right at this moment, to see his friend the Hulk. Less happy are the crowd, Grandmaster, and Loki. They would like bloodshed, not happy reunions, please. Also, I am going to take a wild stab and say that Loki’s not the biggest fan of the Hulk, either, after Avengers. He’s hoping both of them go out, honestly. Look at his face. And we end with the delightful Thor reminding us that he’s basically a golden retriever as he says, “We know each other. He’s a friend from work!” and then gleefully gets into a fight with his work friend. It’s not a huge surprise that all of this footage appears to be from the earliest part of the movie. That’s how movies these days keep from spoiling things: you end up seeing almost all of the first act and very little from the end. This teaser is very heavy on that early stuff because we know that the rest of the movie is a “road trip,” so Sakaar can’t be nearly as prominent in the actual story as it is here. That said, it’s also absolutely delightful. 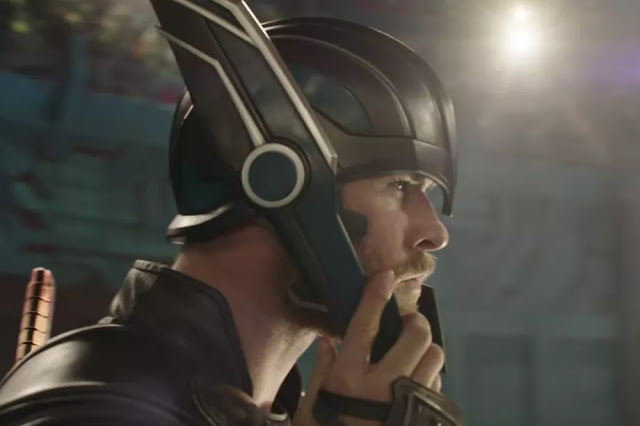 0 Response to "With Thor: Ragnarok, Marvel hopes to find new, fresh stories away from Earth"